I've just come off the phone to Jim Acher at Ocean Independence in Palma who's enthusing about his latest central listing, the 27.4m sailing yacht Lisheen Lady. An aluminium William Garden designed pilothouse cutter sailing yacht, Lisheen Lady was built in 1978 at Stephens Marine in Stockton, California. According to Jim, she's a one of a kind sailing yacht with a high bow and fine entry, assuring an ocean going ability, even in difficult sea conditions. 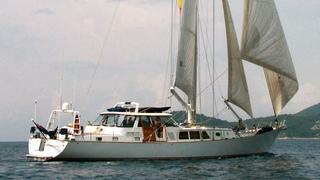 She has sufficient water and fuel storage to cross the Atlantic and is capable of 10-12 knots under sail. Her interior has been meticulously improved and maintained, with the generous wheelhouse providing ultimate protection from the elements, allowing comfortable sailing in any weather. The interior provides unparalleled space in comparison to other yachts of this size. She has three levels of lounging, relaxing and dining, allowing passengers and crew to find a space of their own. Lisheen Lady has well-appointed accommodation for six guests in three en-suite cabins (including his and hers toilets in the master cabin and a bath in the port guest cabin) and up to five crew. Lying in Palma, Lisheen Lady is asking €1.3 million.